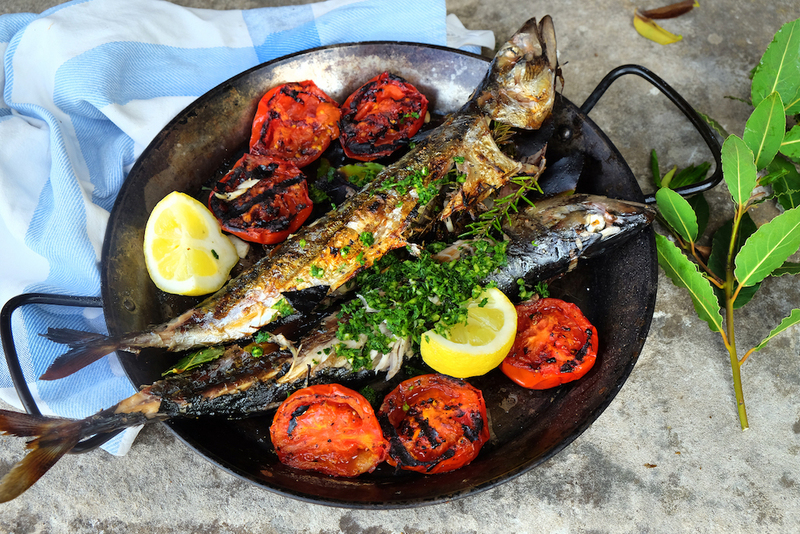 Mackerel is a favourite fish of ours, it is so versatile and easy to prepare. It lends itself well to the BBQ as it is an oily fish that holds together well, soaks up the flavour and gets a deliciously crispy skin. Here we are serving it simply, stuffing it with woody herbs, lemon, garlic and olive oil, and make sure you season the skin well with lots of sea salt and cracked black pepper. The key ingredient here is the bay which works famously. To get the full impact of flavour stuff as many leaves that will fit into the cavity of the fish, and then take a couple of branches (if you don’t have a branch stick leaves on a skewer or a long twig) and once you have put the fish on the heat stick the branches onto the coals so they catch alight and infuse the smoke with the wonderful bay fragrances. We serve mackerel in many ways, not one better than the other – raw, smoked, pickled, sautéed, grilled, all totally delicious and all very different. Smoked is fantastic as it really holds in the flavour, a bit like what we are doing here with using the burning bay leaves to flavour the fish. I remember once when we were younger and off on a cooking job up in the North of Scotland a few people had taken a boat out and caught a substantial amount of mackerel, which they brought back to us to prepare for supper. We filleted and thinly sliced them and served them as sashimi with different dipping sauces, never have we tasted Mackerel so wonderfully fresh, it was quite different. Mackerel, a good source of Omega-3 fatty acids and vitamin D – something we are all lacking living in cloudy old England is a great addition to a snack or salad. When we are in a rush and don’t have time to stop to cook lunch we toast a little sourdough, drizzle with olive oil and top with smoked mackerel, avocado, lime, basil and chili, it is really good. 1. Start the BBQ and get nice and hot. 2. Wash the fish and pat dry. Stuffed with plenty of the bay leaves, Rosemary, parsley, lemon and garlic. Drizzle generously with olive oil and salt and pepper and rub in on both sides. 3. Slice the tomatoes in half, drizzle with olive oil and season with salt and pepper. 4. Place the tomatoes cut side down on the BBQ and leave there, you want them to blacken on that side (you wont need to turn). 5. Carefully place the mackerel on the BBQ. Cook for 5 minutes on that side. Take your bay leaf branches, or just leaves will do and put them on the coals under the fish. You want them to catch and the smoke will do wonders for the fish. Very carefully turn the fish and cook for a further 4 -5 minutes, till opaque. 6. Remove the tomatoes and place on a serving platter, along with the two mackerel. Dig in.